Lt. Georgiana Taylor's work as an Army Evacuation Nurse brings out her fears and makes her yearn for the safe, pampered life she'd enjoyed back home. Her family and boyfriend are more than happy to urge her to ditch the Army life. John "Hutch" Hutchinson has a girlfriend waiting for him back home. He and his father are working hard to convince Congress to form a Pharmacy Corps and commission officers. Officer Training School would get him back to the States. The disrespect he gets from officers and mean comments about his profession feed his discontent. I loved how these characters developed over the course of the story. The constant danger pushed them to rely on God and realize He was their safety. On Distant Shores provided a generous dose of romance, Christian values, danger, betrayal, and conflict. 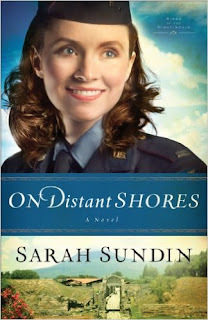 Sarah Sundin is one of my favorite authors, and she delivered big time with this book. I was sorry to see it end. The one consolation: I have the next book in this series. 5 Stars - grab it! It's well worth your precious reading time. Disclaimer: Neither the author nor the publisher requested a favorable review and did not provide any remuneration for it. All opinions expressed here are mine alone. Writers: Have you considered writing a series? What are your thoughts on the subject? Readers: What do you like about historical romances? Sounds like a series I'd like to read! :) I accidently started writing a series because I loved the characters so much. Thank you for the lovely review, Susan! I'm glad you enjoyed Hutch & Georgie's story!